Nutrition tailored to the flowering and fruiting phases. V12 Fruit is a unique blend of specific minerals, amino acids, vitamins and natural plant growth stimulants (e.g. kelp and brassinolide) to be used in the reproductive growth phase of crops. Foliar application: Min 150 L/ha water volume. 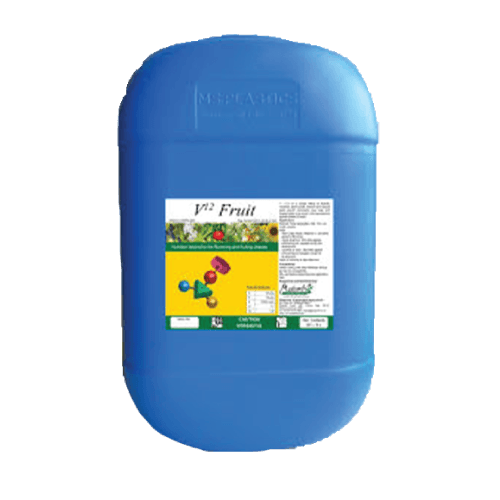 Veg & small fruit – 500 ml/ha applied at flowering and repeated during fruit development. Orchards & vines – 500 ml/ha applied at flowering and repeated during fruit development. Apply in morning or late afternoon. When mixing with other fertilisers always jar test for compatibility. Mix well before dispensing into application tank. Produces more even, wellsized fruit. Biostimulation of the flowering and fruit phase – pollen formation, fruit set, fruit size & quality. Brassinolide in V12 Fruit improves flower formation, pollen production and fruit development. High levels of boron in V12 Fruit aid in the production of pollen and reduces deficiencies associated with flower and fruit drop.